Scotland, Dalzell Farm, c1807. Counterstamped French five francs. 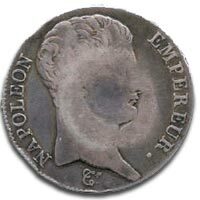 This counter stamped coin, was used to pay workers on the Scottish Dalzell Estates, and was issued by Archibald James Hamilton (1793-1834). 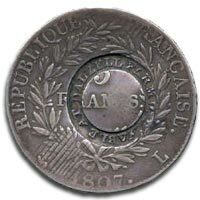 Obverse … Bayonne, bust with reverse countermark in wreath. Reverse … Adjustment marks by date. Countermark very fine, coin good to fine, very rare. ex Walter Allen Collection, Spink, 14 Mar 1984.
ex Gibbs collection, Hans Schulman, 19 Nov 1968. The eldest son of General John Hamilton, 11th of Orbiston and 6th of Dalzell. Archibald James Hamilton was an idealist and social reformer, and was chiefly responsible for the establishment of an experimental socialistic community on Orbiston Estate. Hamilton also set up The Practical Society, which was a co-operative movement set up in Edinburgh in 1821 in partnership with fellow social reformer, Abram Combe. The Practical Society aimed to improve the lives of members and opened a store for the sale of goods to 500 families. A school was established and members were required to sign a pledge to abstain from drink, tobacco and swearing. Quite successful at first, the Practical Society foundered within a year when the storekeeper appropriated Society funds. Hamilton and Combe then proceeded with plans for the grander, co-operative experiment at the Orbiston Estate.